with all this pumpkin-carving i’ve been doing, i have lots of pumpkin seeds hanging around. rather than throw ’em out, why not roast them or toast them for an tasty, easy, seasonal snack? 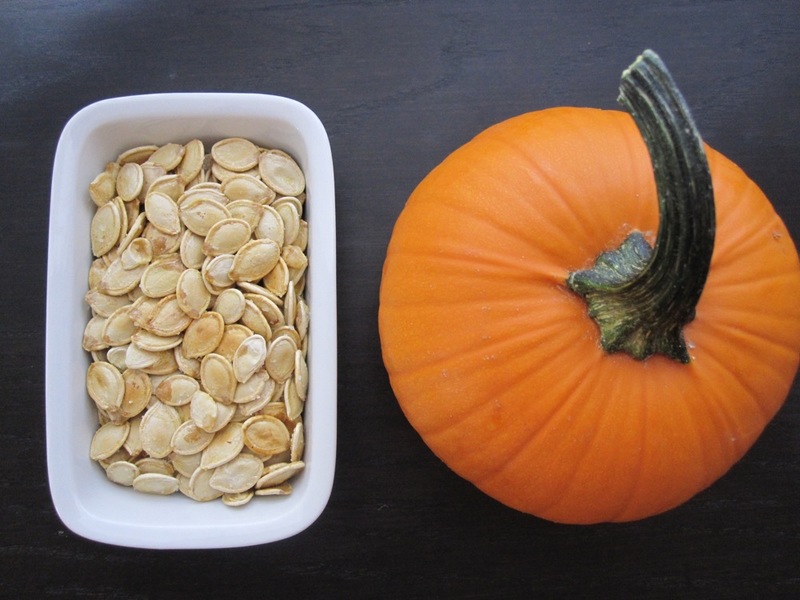 there are two traditional methods for cooking pumpkin seeds – oven roasting, which takes about 30-45 minutes, + skillet toasting, which takes less than ten minutes. i prefer skillet toasting, as it is significantly quicker, it’s easier to monitor the doneness of the seeds, + i think it retains the moisture of the seeds better. to glam up the pumpkin seeds, i used white truffle oil in addition to extra virgin olive oil. for those who haven’t tried white truffle oil, it has a flavor that is both delicate + earthy – it adds a wonderful depth to dishes + in my opinion, is worth investing in. i got my truffle oil from gourmet delights, but you can also try dean + deluca or sur la table, who sometimes carry it. not to toot my own horn, but these are easily the best pumpkin seeds i have ever had. the white truffle oil definitely dresses them up a bit + adds an interesting dimension to them. if you have some pumpkin seeds laying around, absolutely give this recipe a try – you will not be disappointed! combine the two types of oil in a pan or skillet over medium heat. once the oil is hot, add the pumpkin seeds. toast for 5-8 minutes, stirring frequently, until the seeds are lightly browned. transfer seeds to a paper towel-lined plate, which removes any excess oil. allow the seeds to cool for a few minutes, toss with kosher salt, + serve at room temperature or slightly warm. the pumpkin seeds will keep for about a week in an airtight container. beth, i didn’t know that. thanks for the tip! Yummy! All your posts look Delicious! I’ve printed them all out to try! aww, thanks Mal! let me know how they all turn out! YUM YUM! Not all truffle oils are created equally. Make sure they use Extra Virgin Olive Oil. If they went cheap on the oil, you know they went cheap on the truffle. EVOO is a must for great truffle oils. And there should be an actual piece of truffle in every bottle. After trying over 30 truffle oils, all but 2 [I Peccati di Ciacco (white) & Casina Rossa (black)] had a chemically aftertaste that I found very offensive. Disclaimer: I own Gourmet-Delights.com, but I wouldn’t sell anything I do not use myself and recommend to my family and friends. Also try drizzling the truffle oil on them right out of the oven, or substituting Truffle Salt to enhance the truffly flavors. Even adding a drizzle of pumpkin seed oil may be exciting!!! Lots for me to play with in the kitchen this week. THANKS AMY! thanks for all the awesome info + tips, jeff! the truffle oil is just amazing! 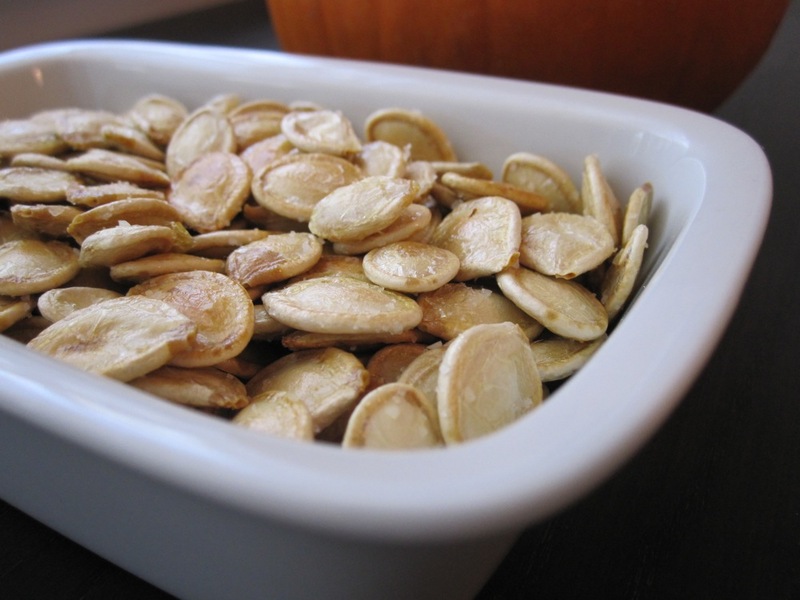 Amy, I randomly saw your blog entry update on facebook while I was perusing some appetizer ideas for our Halloween party on Saturday and am SO glad you introduced me to such a wonderful way to make those pumpkin seeds edible! After dabbling with the oven roasting method for a while (and throwing out a few years worth of dry/icky seeds), I think the skillet is totally the way to go — these came out great and my serving bowl was empty early in the night! Frankly, any excuse to use truffle oil/truffle salt/truffle anything is a winner in my book. Love the blog, hope you are well and enjoying Nashville in the fall. – greetings from Boston!